Sauerkraut is made with just two ingredients - cabbage and salt, with a bit of time thrown in for good measure. I used four small sugarloaf cabbages and four tablespoons of Olssons organic cooking salt. 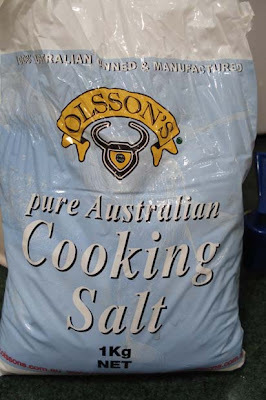 This is pure Australian salt. Do not use table salt, the salt must be pure, with none of the additives normally found in table salt. The process of fermentation should take about 3 - 4 weeks, but it will depend on the temperature here in the house during that time. Ideally the temperature should be around 23 - 24 degrees C (75F), if it gets a bit hotter it will take less time but the sauerkraut won't taste as good. If it is colder, it will take longer. 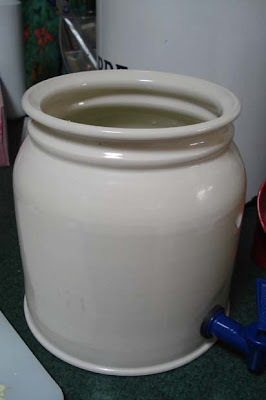 I used a stone crock to make my sauerkraut, you could also use a new plastic bucket or similar large container. Wash the container thoroughly and pour boiling water over the interior. Dry with a clean tea towel. 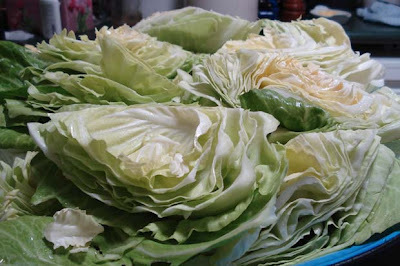 Wash the cabbages thoroughly, removing all dirt, outer leaves and damaged pieces of cabbage. Cut into quarters. Remove the core in each piece. Place cabbage quarters on a clean tea towel, cut side down, to drain. Remove as much water as possible. 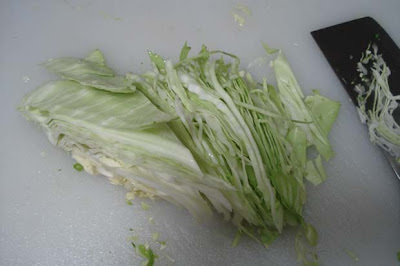 When the cabbage is fairly dry, start shredding it as finely as you can. I started using my mandolin but I almost cut my finger on it (again) so I used my Chinese chopper. 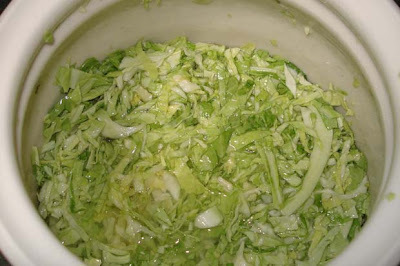 When you've shredded a small amount of cabbage, start adding it to your container. When you have a layer of cabbage, sprinkle over some salt and rub it into the cabbage with your clean hands. This gets the salt into the cabbage and starts the process of osmosis that removes the water from the cabbage and forms the brine. Keep shredding and adding your cabbage in layers, and for each layer, add salt, rub it in and push it firmly into the container. Continue doing this until all the cabbage has been shredded and salted. You will notice above how there is a lot of fluid in with the cabbage. This is the brine the cabbage and salt makes. No water has been added, that is all the water that has come from the cabbage. 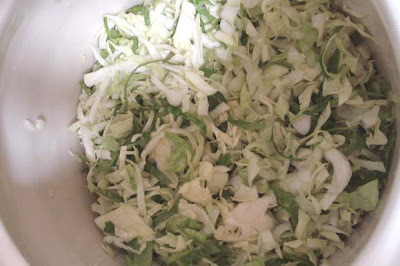 There should be enough brine to cover the cabbage completely as this helps the process of fermentation. Place piece of clean cotton cloth over the cabbage and then a small plate on top of the cloth. Get a heavy plastic bag, or two freezer bags (one inside the other) fill the bag with water and push it into the container over the plate. This will weigh the cabbage down so it will remain in the brine. 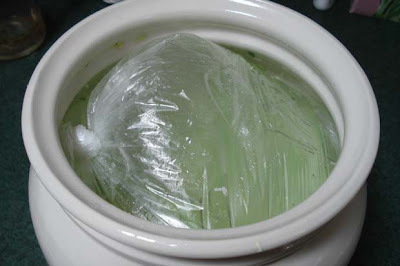 Then cover the opening of the container with plastic wrap and place a towel over it. Store it in a coolish (23C) area for a few weeks. The formation of gas bubbles indicates fermentation is taking place. Every day you must check the sauerkraut. When scrum starts to form, remove the cotton cloth and plate and wash them thoroughly with soap and water. Rinse well and place in a small dish. Pour about a litre of boiling water on the cloth and plate to scald them. When cool enough to handle, wring out the cloth and replace it over the cabbage - along with the plate, the water filled plastic bag, the plastic wrap and the towel. If the water filled bag is covered with scum, either replace it with a clean bag or wash it thoroughly before replacing it. After about 3 - 4 weeks of checking it every day or second day, the fermentation should be complete. You can tell this has happened when the cabbage stops bubbling. Then you can either place it in containers to be stored in the fridge or process it in a water bath (Fowlers Vacola or canner). If it's stored in the fridge, you'll need to eat it within a month. To process in a water bath, for storing long term in the cupboard, heat the sauerkraut, place into your jars, leaving half an inch head space, bring up to 92C and boil for 15 minutes for small jars or 20 minutes for large jars. I've just been reading up on making sauerkraut so I'm pleased to see all your pictures Rhonda. Sauerkraut is the only thing that makes vegetarian sausages and hotdogs bearable :-) Besides it is delicious and so good for you. I'm on the lookout for a suitable container that isn't plastic. We have quite a few cabbages growing now. I will definatly be giving it a go. I don't have a fowler's vacola or canner. How would I do that step as I would like to store it long term? I have only recently discovered your blog and I love it. It's so inspirational. ok, i'm going to jump in the water and make kraut this year. i can do this. i still have a while to wait for the winter garden to come on, but saurkraut is on my list! thank you! I wondered if the water bath canning destroys the beneficial bacteria we have encouraged to grow?